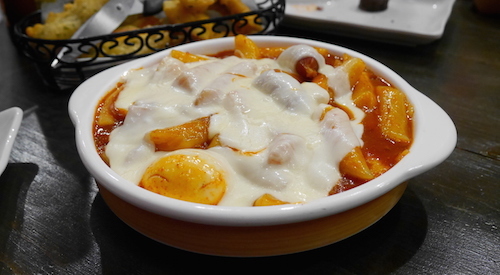 On streets of Seoul or other Korean cities, a popular snack food purchased from vendors is tteokbokki, a simple dish of rice and fish cakes in a sweet and spicy chili sauce. After (or during) a night of drinking, hungry youngsters will crowd under a pojangmacha tent selling these dishes and others. 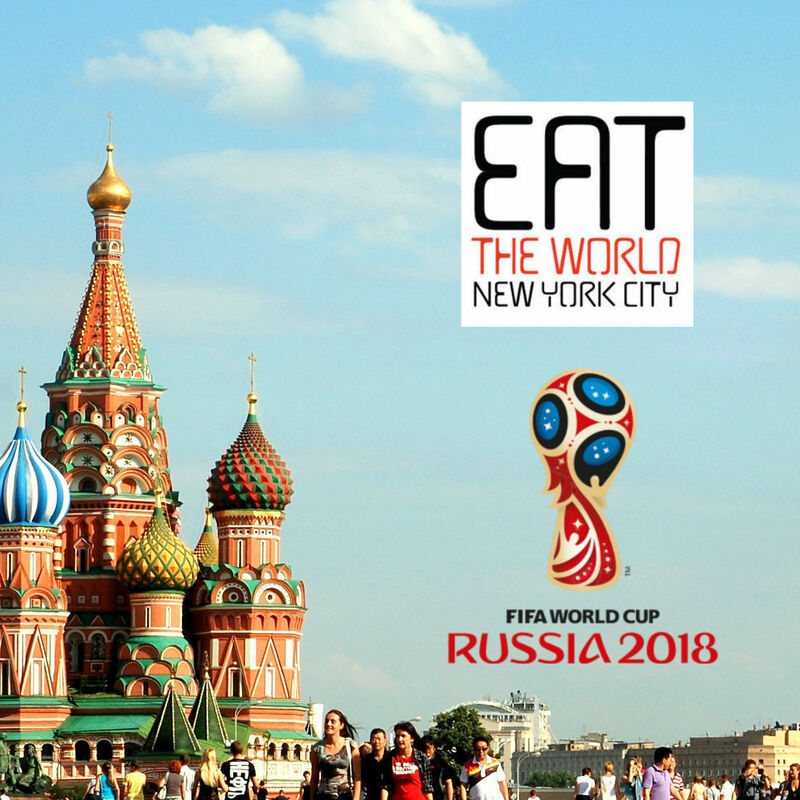 In New York City, we do not have something like this yet, but a couple places carry the dish, including new specialty shop DDM Yupdduk. 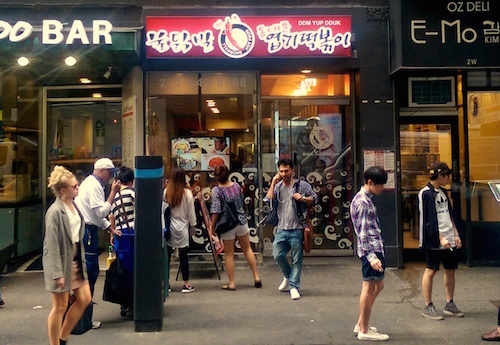 The popular Korean restaurant with full name Dongdaemun Yeopgi Tteokbokki has opened (and closed apparently) a shop in Palisades, New Jersey, and since October a small location on 32nd Street in Manhattan. The Korean store can be found listed as one of the spiciest places to eat in Seoul, an honor that should not be taken lightly as Koreans enjoy their heat. Here in Manhattan, diners are given the option of three levels of spiciness. Since it was our first time, we opted for yupgi combo A ($26.99, below 4 photos), which allowed us to sample the specialty but also includes three other dishes that pair well. 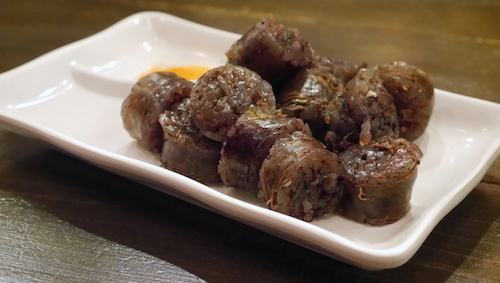 Sundae (above) might sound like dessert, but comes out first and is a sausage made from cellophane noodles, a much watered down version of what this usually consists of: blood and intestines. 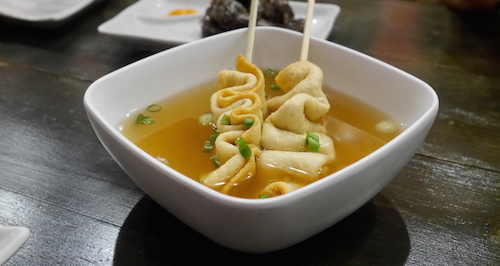 Skewered oden (above) is fish cake in a an oden broth. This is commonly borrowed from Japan and usually served with spicy soups purchased on the street, working somewhat as a tastebud relaxer. 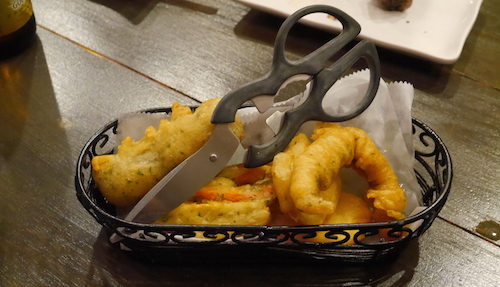 An assortment fried set (sic, above) comes with a handy pair of kitchen shears. You will find within one sweet potato, one seaweed roll, one vegetable to be named later, and one piece of squid. And the real reason to come here if you have not tried the dish already is the yupgi topokki (another version of the word tteokbokki we talked about before), the heaping casserole of rice and fish cakes. We went for the assorted yupgi topokki (below), which adds a boiled egg and a mess of mozzarella cheese on top of everything. On their three level scale, this was made as "spicy" (rather than mild or extremely spicy), and definitely had our brows sweating. The red chili pepper sauce is not all punch though, it is moderately complex and has a sweetness to it that makes you want to dip the fried pieces and sundae into it all night. 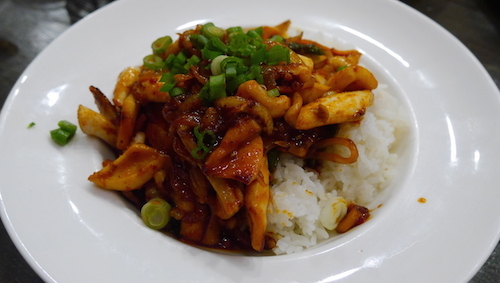 To round out our meal, the table also shared a plate of squid over rice ($10.99, below) which we all enjoyed. This spicy sauce was a bit different than with the yupgi topokki, but hard to tell apart once everything was tingling. 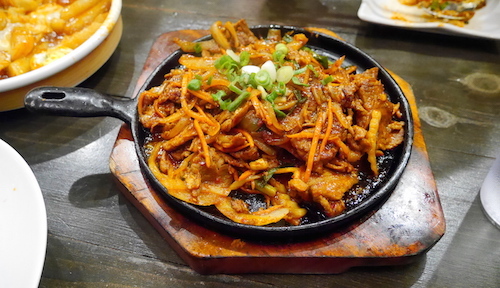 And furthering the amount of red things that entered our mouths, we also ordered the spicy pork over rice ($9.99, below) which came with the spicy red sauce and was served on a cast iron skillet. It was tasty in a way that marinated pork is always tasty, but lacked the depth of the other dishes. On a sandwich board in front, the restaurant also advertises ramen, and this seems to be a popular option amongst diners as I saw it on quite a few other tables. At $7.99 for a big bowl, it also seemed like a steal. Until Midtown Manhattan gets itself a pojangmacha, this restaurant is going to have to do the trick for Seoul street food. It is a completely unpretentious and reasonably priced place. If we had not ordered multiple rounds of beer, our bill would have been no more than $20 per head for the feast we ordered up.